Talons may seem like just another jet, but they have played a unique role in aviation and human spaceflight history. In fact, astronauts have a deep respect for the T-38. Why? Because before astronauts flew the shuttle, they practiced with a T-38. 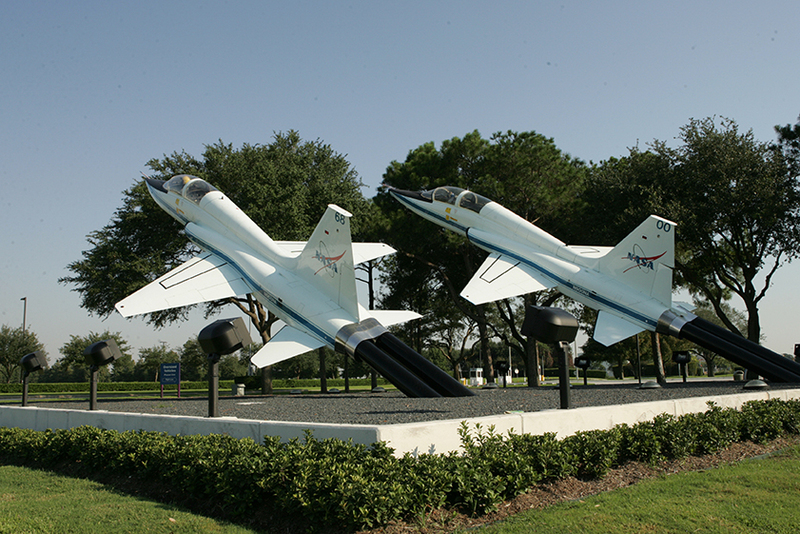 Talon Park at the entrance to Space Center Houston is home to a team of T-38 jet trainers. 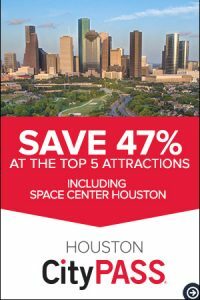 These historic artifacts welcome visitors from around the world to Space City, a unique place that has played a significant role in the journey of human space exploration. 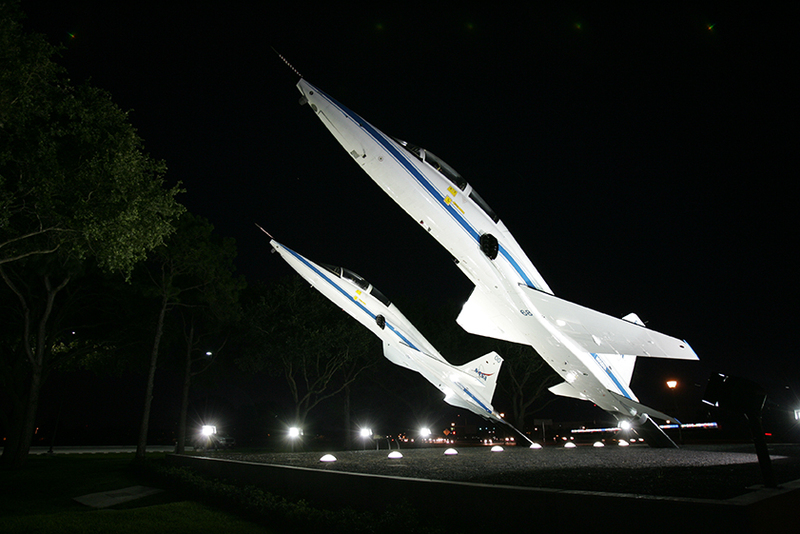 The T-38 was used as a jet, to encourage quick decision making in rapidly changing situations, a skill an astronaut needs to be able to master in the unforgiving environment of space. The lessons they learn in the cockpit of a T-38, help astronauts prepare for tough situations they may encounter during their mission. The aircraft also provided a glimpse of what to expect for many shuttle astronauts. The seating arrangement in a T-38 (one pilot behind the other) was very similar to what they would encounter on the flight deck of a shuttle, whereby a pair of mission specialists would sit behind the commander and pilot. Similarly, the pilot in the front seat of the T-38 handles the flying while the mission specialist sitting behind is responsible for navigation and communications, such as talking to control towers. 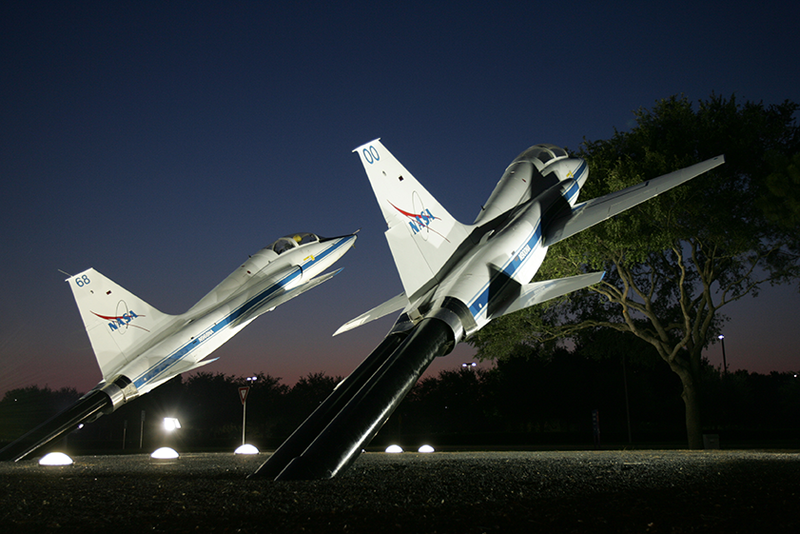 Each T-38 is powered by two afterburning J85-5(N) engines, allowing for supersonic flight up to Mach 1.6. The aircraft can cruise above 40,000 feet (that’s 10,000 feet above typical cruising altitude of a commercial airliner), and it can pull more than 7 Gs, or seven times the force of gravity (enough to make someone’s breathing become labored and make lifting one’s hands an extremely difficult endeavor). Astronaut Terry Virts describes the T-38 as a, “great aircraft” for NASA, because of its speed, performance and simplicity. 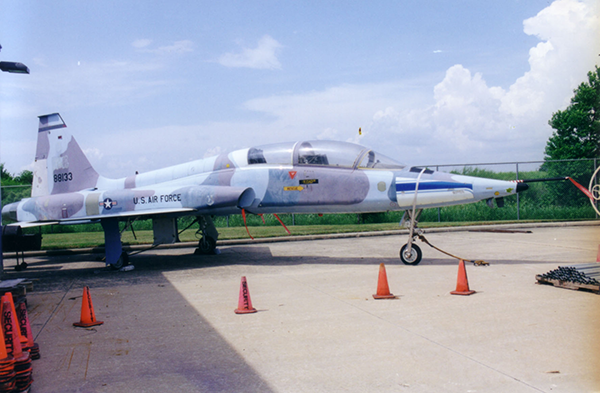 The T-38 was first fielded by the U.S. Air Force in 1961 as an advanced jet trainer. The aircraft is sometimes called the “white rocket” for the length and color of its narrow fuselage. 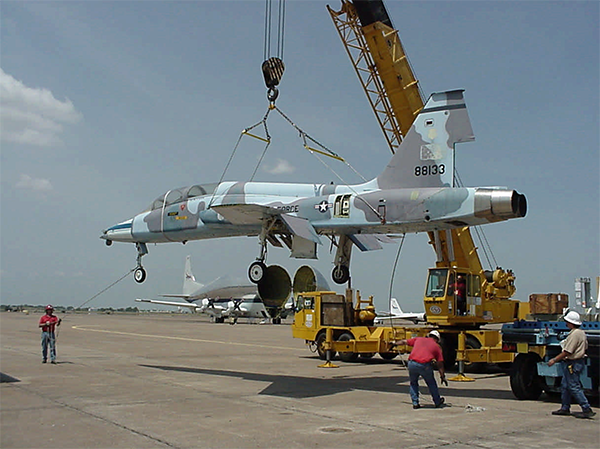 Aircraft was not originally “00.” It was given this number at the time it was painted for our display. It’s a made-up number assigned by NASA at Ellington to the static displays. Several aircraft were acquired from the USAF and these came from Holloman Air Force Base (AFB), New Mexico. It was acquired for parts, in the early 1990s and stored by NASA in El Paso for many years. 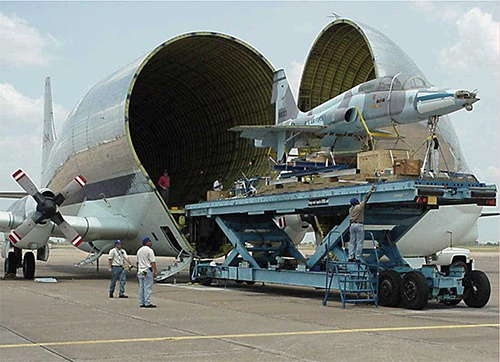 It was delivered from El Paso to Houston in NASA’s Super Guppy. In the 1980s it was owned by the USAF and was based at Edwards AFB in the 6510 TEST WING 1986. The pilot with a yellow helmet in N968NA is “Flat Stanley.” This is written on the name tag of the flight suit. Casper is written on his mask. Dave is the name written on back of his helmet. The pilot with a gold helmet in N900NA, is a woman mannequin named “Wulffraat.” The name Abbey is written on her mask.